Some of the most charismatic and versatile domesticated animals, mules have been used by humans for millennia, working as load-bearers, cart-pullers, and even racing mounts. The exact origin of the mule as a species isn’t known, but it’s likely that the first mules were the result of pairings between wild asses and horses that lived in the same habitats; this is a rare occurrence, though, and nearly all mules throughout history and up to modern days have been domestically bred by humans. Mules were first popularly bred by the ancient cultures of Paphlagonia (a region that’s now part of Turkey), and they were used as valued pack animals in ancient Egyptian, Greek, and Roman civilizations. The mule was also seen as a highly valuable mount in many societies, often being reserved specifically for the use of royalty or nobility. Christopher Columbus first introduced the species to the Americas in 1495, breeding together donkeys and horses that he had brought with him to the New World for the Conquistadores’ explorations. The word ‘mule’ itself typically refers to the progeny of a mare (a female horse) and a jack (a male donkey), who, although they belong to two different species, are able to readily breed and produce offspring. Interestingly, foals of jennets (female donkeys) and stallions (male horses) pairings are called hinnies, but they’re far more rare in number, since a jennet’s body is far more efficient at detecting and defending against foreign DNA than a mare’s body. Both hinnies and mules fall under the same species and tend to be classified together as mules. Although the adage ‘stubborn as a mule’ is widely quoted, in actuality, mules are truly intelligent survivalists, and won’t willingly put themselves in danger from overwork. They’re also widely praised as being anecdotally more patient than horses or donkeys, as well as stronger, more compliant and more curious than their donkey sires, making them hardy, enduring companions. The size and appearance of a mule can vary drastically from individual to individual, and really depends more on the size and lineage of their equine dam. Mules can range from miniature sizes, to smaller pony-types, to tall and lightweight physiques, and even up to moderately heavy weights when they’re bred from draft horses. On average, though, the weight range for a mule is between about 820 and 1,000 lb. In appearance, mules tend to have the thinner limbs, narrower hooves and short manes characteristic to donkeys, but the height, neck length, tail appearance and hindquarters are horse-like, as is their coloration. Mules can appear in sorrel, bay, black or grey, as well as (less commonly) roan, paint, and Appaloosa variations. These personable beasts also have a unique bray, which often sounds different from mule to mule – a humorous combination of ‘hee-haw’ and ‘whinny’. A fantastic example of hybrid vigour (a phenomenon where hybrid offspring improve upon their parents), and more able to resist common diseases and parasites, mules can survive off of less nutritious fodder, and also typically have a longer lifespan than either horse or donkey. Their skin is less sensitive to pressure and changes in temperature and they’re also adaptable and able to better withstand more extreme climate conditions. Mule hooves are also narrower in size, but thicker and harder in material composition than those of horses. A mule’s diet (entirely plant-based) tends to depend on the work they do, but, like horses and donkeys, they can thrive mainly on timothy or grass hays, or fresh pasture grazing. Unless they’re frequently working for long periods, most mules don’t need to eat richer alfalfa or grains, since they tend to use the nutrients in their food more efficiently than their equine parents. Mules also tend to be far less likely to consume toxic plants, and won’t generally overeat. The major growth spurt for mules generally happens later than with horses - around 3-4 years of age - and some mules continue growing in height until they’re 8 or 9 years old. Aside from their slower development rate, the reproductive characteristics of mules are perhaps the most fascinating aspect of these animals. Mules (and hinnies) have 63 chromosomes, which differ from a horse’s 64 and a donkey’s 62. This means that chromosomal pairing typically doesn’t happen correctly if a mule were to mate, meaning that most mules are sterile (not able to produce offspring). There are a few recorded exceptions, however; as historical records since 1527 show 60 cases where foals were carried to full term and birthed from the mating of mule mares with male horse or donkeys. Although the use of mules has declined enormously in North America with the introduction of industrial machinery in the late 20th century, mule breeders continue to breed these equids. They are often forced to perform more work than their small bodies can handle. 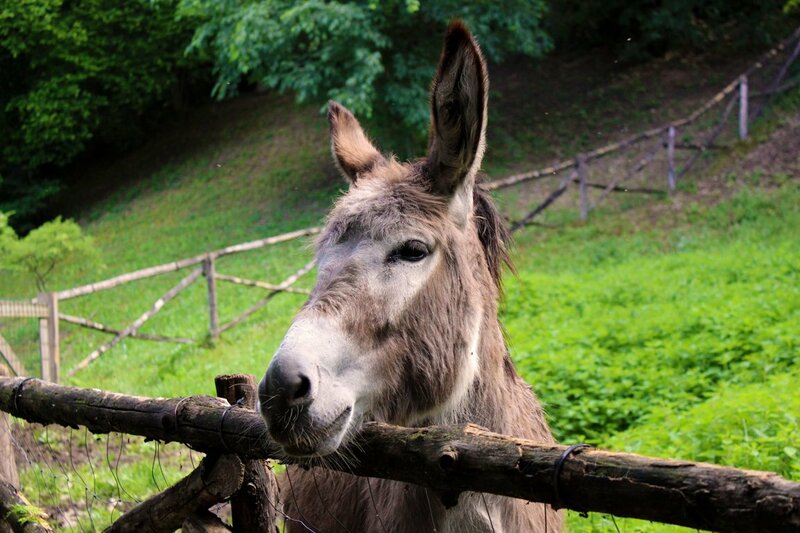 Mules are sometimes kept as "pets", often poorly cared for. Many are left to fend for themselves. They develop deformed and crippled feet, become emaciated or obese and suffer from dental problems and parasite infestation.